Park Hang-seo’s arrival to Việt Nam raised questions as he was a complete unknown to most football fans in the country. But he has made history after only 14 months on the job. 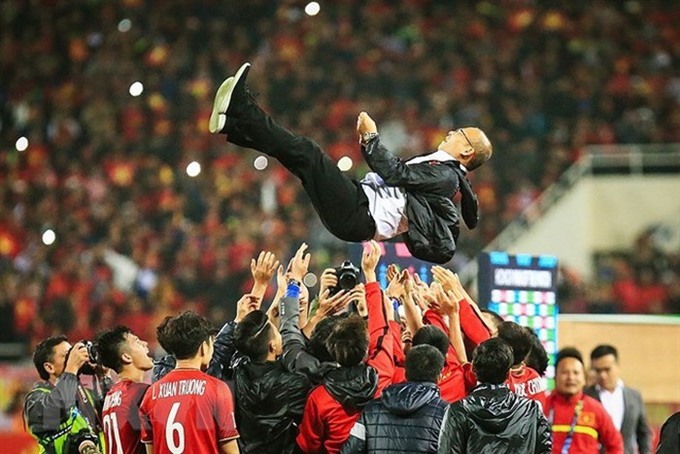 The South Korean manager has changed the face of Vietnamese football and pushed it to new heights. He made the country champions of ASEAN and a strong force in Asia. When Park signed, the leaders of the national football programme expected him to lead Việt Nam out of a national crisis after a humiliating defeat at the all-important Southeast Asian Games. Park came to Việt Nam from Changwon FC, which was playing in the Korean third division and had recorded 15 winless matches. The tactician was most famous for being Guus Hiddink’s assistant when South Korea finished fourth at the 2002 FIFA World Cup. At the contract signing ceremony in October 2017, the Việt Nam Football Federation hoped to see new chapter in national football under Park’s two-year reign. Their target for the newcomer was the ASEAN Football Federation (AFF) Cup, which the Golden Dragons had waited a decade to win since their famous victory in 2008. The programme had missed out on qualification for two consecutive Asian Cups in 2011 and 2015. But Park made a strong commitment for Việt Nam: be competitive at the Asian U23 Championship, rank in the top 100 national teams in the world and win the AFF Cup title. So far, he has met his goals and excelled in every tournament. Before Park, the Golden Dragons had registered a win in only one of their previous five matches. In his first match in charge, Park led the team to a 5-0 victory over Cambodia in Asian Cup qualification. At the Asian U23 Championship in China, Việt Nam qualified for the knockout round from a strong group of South Korea, Australia and Syria. They defeated Iraq and Qatar in the quarter-finals and semi-finals, respectively, before losing to Uzbekistan in the last minute of the extra time in the final. It was the first indication Park’s promises would be met. Park then helped the U23 side to fourth place at the Asian Games in Indonesia – their best finish in 56 years. Park completed his second promise when Việt Nam was ranked number 100 in the world in December. Then came the 2018 AFF Cup. The 60-year-old took the Golden Dragons to the title after a 10-year drought, completing his third promise in the process. For a while, Park’s team held longest active undefeated run in international football – 18 matches. Việt Nam, the youngest squad in the Asian Cup in the United Arabia Emirates (UAE), defied all odds to romp into the quarter-finals after two losses and one win in the group round and a penalty shootout against Jordan in the round of 16. They suffered a narrow 0-1 defeat to powerhouse Japan. Even Samurai Blue skipper Maya Yoshida admitted luck was on their side in the match. "For us, reaching the [Asian Cup] quarter-finals is really satisfying,” Park told the-afc.com. “To be honest, we didn’t have enough time to prepare for this tournament after participating in the 2018 AFF Cup, but I think my players did their best,” he said. “Even though we lost to Japan, the players did really well and showed their fighting spirit, and I am really satisfied with that. My players have a big desire to reach the next level. Even though football in Việt Nam is not at its best at the moment, my players can only get better. Working with a limited player pool, Park is the mastermind who brings out players’ potential to create an outstanding team. Park has consistently provided surprises with his player selections for international tournaments. His line-up choices and substitutions have also proven unexpected, but they all seemed to work perfectly. Park seems to understand each player’s strengths and weaknesses. He always highlights the team’s spirit and focuses on building a competitive attitude. Under Park, the players never give up no matter who they are playing or what the score is. “Our players know very well that we are one team, and I always remind them that we are fighting together,” he said, citing the unity in his team as the reason they earned a spot in the quarter-finals. Under Park, Việt Nam have a solid defence and a blistering attack. Following trends in world football, Park prefers a flexible 3-4-3 system that has turned Việt Nam into a modern outfit playing attractive and enterprising football. Meanwhile, sport commentator Quang Huy said: "The forwards were also wonderful. They were confident to either break through or play one-twos against bigger and taller rivals. It was due to their good technique and determination. Prior to the tournament, I did not think Việt Nam could play a balanced game against Japan. After this match, I believe we have stepped to a higher level of football." “The head coach [Park] is building a good team and they have had very good results in international tournaments,” Japan coach Hajime Moriyasu said on foxsportsasia.com. Park also knows how to narrow the gap between players in the first team and substitutes, and has said he has 23 players who are ready to compete at any time. Former language assistant Lê Huy Khoa revealed that after shaking hands with first-team players following the historic U23 final, Park went to each substitute and apoligised for not giving them a chance to play. He also has his faith in young players. Twelve of his 23 men at the AFF Cup also played in the U23 tournament and the Asian Games. The likes of Nguyễn Quang Hải (21), Đoàn Văn Hậu (19) and Nguyễn Tiến Linh (21) look set to lead the way forward for Vietnamese football. As a foreigner, Park respects local culture, and loves his players like sons. He is strict and demanding in training and competitions, but he also cares a lot about his youngsters. Park seems to be the first coach who is deeply involved in his players’ preparation. He is one of the rare managers who demands his injured players get business-class seats on flights. And he is among the small number of foreign coaches who puts his hand on his chest with respect when listening to Việt Nam’s national anthem. The fun, charismatic coach is always listening to people and smiling with everyone. But he knows how to manage his unruly players. Captain Quế Ngọc Hải is an example. Under Park, he has transformed from hotheaded youngster to a quintessential leader. He has said many times that Park is not their coach, but their father in a footballing family. Park and his team arrived home on Saturday. They will have time off for the Tết holiday and local leagues before returning for action to prepare for 2022 World Cup qualification beginning on September 5.